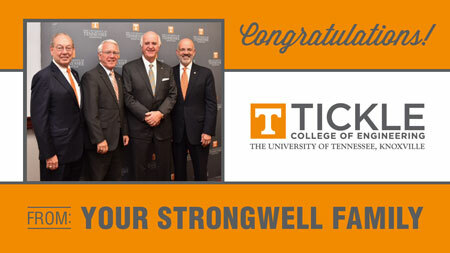 The University of Tennessee Board of Trustees recently voted to name the College of Engineering for John D. Tickle, Chairman of Strongwell Corporation and alumnus of UT Knoxville. The Tickle College of Engineering houses 39 academic programs across seven departments, offering affiliations with numerous research centers and institutes, including the UT Space Institute. This is only the second time in UT’s history that any of its colleges have been named for an alumnus. Tickle is a long-time benefactor to the University of Tennessee. In 2013, the $23.1 million, 110,000-square-foot, John D. Tickle Engineering Building was opened to support the rapid growth of UT’s engineering program. Tickle is currently chair of the engineering campaign committee as a part of UT’s Top 25 Campaign, tasked with raising $150 million. John Tickle is a very familiar name in the world of composites. Last year, Tickle celebrated his 50th year in the Composites industry, beginning his career in 1965 with Owens Corning. He has been with Strongwell since 1972, when he was hired as President and General Manager of the company. Over the years, he has worked diligently to promote the use of composites and been a champion of the industry as a whole. To see the press release issued by the University of Tennessee, visit http://tntoday.utk.edu/2016/10/14/tickle-college-engineering/.